Tuolumne County Airports Department, O22. Forty minutes in a Cessna 182. Highway 4, Sierra foothills, Columbia, California. Three hours from San Francisco, five and a half hours from Los Angeles. 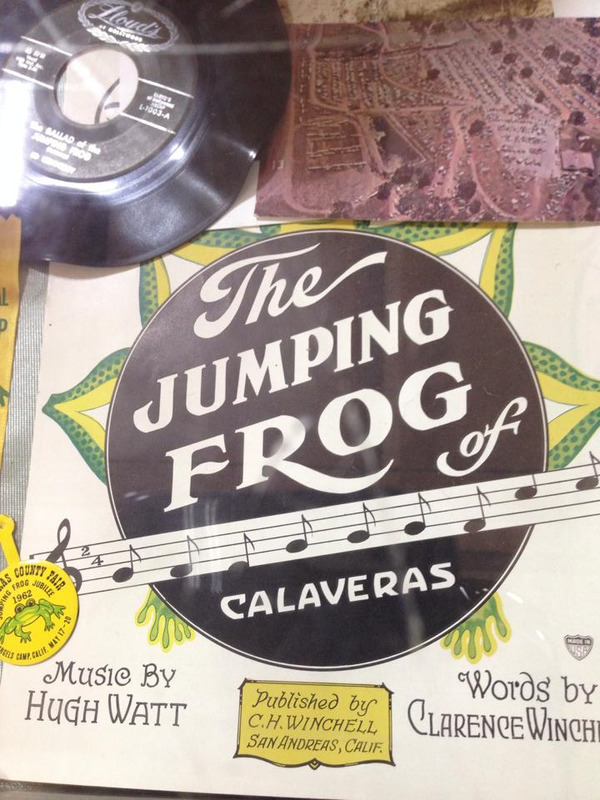 We called a taxi to take us to the Calaveras County Fair and Jumping Frog Jubilee, an event made famous by Mark Twain’s short story, “The Celebrated Jumping Frog of Calaveras County,” published in 1865. Read Twain’s short story for free here. The taxi driver spoke hardly a word, had a barrel shaped chest, sported several tattoos on his thick forearms and made an impression with his broad, bald head. He didn’t seem to mind the long drive to Angel’s Camp, as he would make a nice fare. We had no idea it would cost so much, but we consoled ourselves by rationalizing that we were supporting the local economy, and possibly a local “Sons of Anarchy” motorcycle club member. Once we arrived at the fairgrounds, the joyful frogs were everywhere – on wine labels, t-shirts, tote bags, bibs, aprons and carnival rides. The atmosphere is undeniably American and evocative of small-town character and entertainment that the ghost of Mark Twain would have appreciated. Twain is still here, and in the flesh, too. You can meet him and take pictures at a booth for a few dollars. The Calaveras County Fair’s biggest event is not the jumping frog contest, which pulls in hundreds of spectators, but the late afternoon demolition derby, which draws thousands. We stuck to the frogs, and enjoyed watching the frog jockeys and their teammates prepare the amphibians for serious competition. Everyone wants to beat world record holder Rosie the Ribeter, whose jump of 21 feet and five and one-quarter inches has not been surpassed since 1986. This year’s event takes place Sunday May 21, 2017. Find a full schedule here. The county fair is a real hoot – there are 4-H displays where kids show off their rabbits, cows, calves and goats and almost everyone is a winner when it comes to the quilts, cookies, pies and artwork contests. You can easily walk to town to visit Columbia State Park, which has the state’s best preserved Gold Rush buildings and atmosphere. In fact, on the weekends there are usually dozens of volunteers who dress in period clothing and sell handcrafted housewares, candles and food on the main street. We love the soap shop – most recently we purchased several black Millenium Falcon and R2-D2-shaped soaps from Star Wars. For lunch we love El Jardin at 22758 Broadway Street. Prior to flying back, we always get a coffee or some dessert at the Fallon House Ice Cream Parlor. The friendly service and 19th century décor take you back in time. On Wednesdays and Saturdays you can pick up local produce and organic foods as well as beauty and home products at the indoor farmer’s market located in the former armory adjacent to the airport. The Fixed Base Operator (FBO) at Columbia does not have a crew car. Looking back on it, we could have saved money by renting a car for the day or flying to Calaveras County Airport instead, which has a pickup truck for pilots. Hertz and Enterprise are both located near the Columbia Airport. The airport has a campground and the prices can’t be beat – just $10 per night. In June the airport hosts a Father’s Day fly-in. Contact Information: Benedict Stuth, Airports Manager. Phone: (209) 533-5685. Hertz (209) 588-1575. Enterprise (209) 533-0500. After the short flight, we strolled around the Calaveras County Fairgrounds, traveling back to a more whimsical, mystical time. 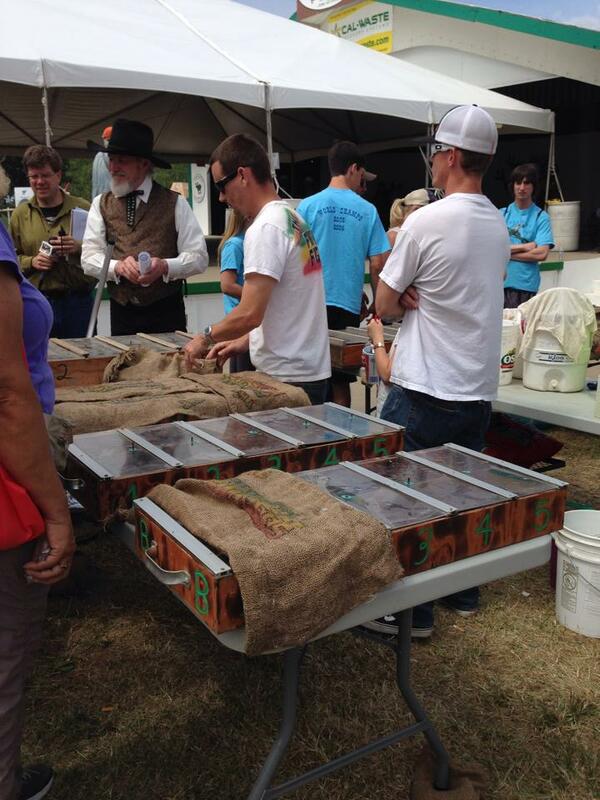 Frog jockeys keep their competitors cool in the hot sun with mistings and burlap covers.